Hi everyone Deb here, it's been to long since my last article that's because we have some new and wonderful models coming into the system after a very long wait. We have great news and it's been a long time coming, landing this week our Cordless LED Halo lighted wall mount mirror powered by batteries. This solves a problem for those having difficulty putting a magnifying mirror in a bathroom that had a power point in the wrong place. The entry price point for a LED halo lighted mirror is significantly lower than those made for Australian 240volt power. The question on many minds is how long do the batteries last? Well because this mirror uses energy saving LED lighting which consumes 70% less than normal globe mirrors a set of 4 AA batteries will last 2 years. One of the key features of this mirror is the auto off timer which adds convenience and saves your battery power if you walk out and leave the light on. The timer will time out after 5 minutes. This magnifying mirror is double sided with 5x on one side being great for touchups, detail and makeup application while on the side 1x being for perfect for all round hairstyling, cosmetics and anything else in between. If your bathroom is a dim environment the LEDs are powerful enough to illuminate your face and not have a bright light shine in your eyes. This mirror comes with optical quality glass to ensure a clearer reflection of your face. 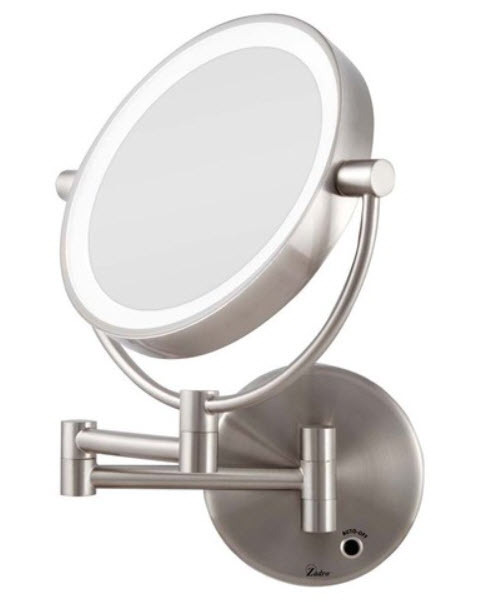 The mounting will allow the mirror to rotate 360 degrees into any position that work for the user. This mirror has smaller dimensions that will work for many who do not require the bigger lighted models. The actual mirror size is 5.5 inches or 14cm across with the overall measurement including the body of the mirror being 7 inches 17.5 cm wide. The mirror pivots on two arms that will extend out 9.5inches or 24cm from the wall and once finished with will fold neatly flat back against the wall. The mirror comes in satin nickel finish which is like polished stainless steel to look at. The best part about satin nickel finish is it does not show the finger marks like the chrome or gold models do. This is the most requested finish currently in vogue in the US. This Cordless mirror is the very latest design that is just right for those who take care of how they look when stepping out stylish, practical, high quality the MWLED45.